Once you have built up a nest-egg, cash flow investing provides a way to earn a steady income stream. But investment strategies to grow a portfolio are not the same ones needed to earn passive income. 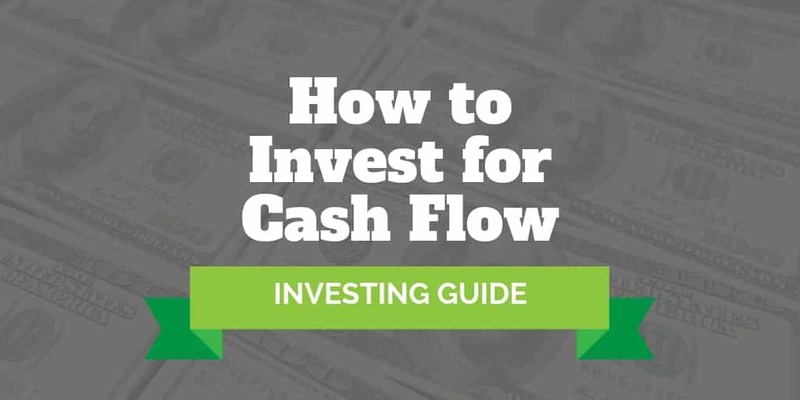 If you are trying to figure out how to invest for cash flow, you’ll want to read on. There are lots of ways to generate cash flow but finding ones that match your risk profile and financial goals are another story. We take a look at various assets that generate cash flow so you can pick and choose the passive income streams that suit you best. Perhaps the most famous of all cash flow investing strategies is buying dividend paying stocks. It stands toe-to-toe with real estate when it comes to cash flow generation. But these days, you are spoiled for choice because old school investment methods compete with new investing strategies, like peer-to-peer lending and crowdfunding. Any financial advisor worth their salt will nudge you in the direction of fixed-income investments, like bonds and bills, as you grow older. Yet the world’s most successful investor, Warren Buffett, argues that stocks will outperform bonds over any 30 year period. So how do you choose among the various cash flow investing strategies? It’s no secret that dividend paying stocks are a tried and trusted source of passive income. Research from Professor Jeremy Siegel of the Wharton School of the University of Pennsylvania has shown that over 95% of total stock market returns though most of the last century came from reinvested dividends. But which stocks pay dividends reliably so you can count on them in your golden years? Headline stocks that jump to mind first, like Facebook, Amazon, and Google, are not good dividend-paying stocks – in fact, they don’t pay dividends at all! Instead, high dividend blue chip stocks that have stood the test of time and survived numerous economic cycles are the best bets for most ordinary investors. Companies like Kraft Heinz, Coca Cola, Visa, and American Express fall into this category. None of them offer the pizazz of high flying stocks but they plod along year after year paying stable and often growing dividends to patient investors. You can often capture a predictable 4% dividend or more each year by buying the best dividend paying stocks for the long term. Once you have a dividend stocks list, you can prune overvalued stocks so you have a margin of safety. Or you could choose the income portfolio strategy from Blackrock that Betterment offers to all clients. Then run the numbers to see if the dividends pay you enough in yearly cash flow to cover your needs. A 4% dividend paying stock means you need to invest $100,000 to earn $4,000 by year end. Any share price rises are a bonus that add to your wealth too. Equally share price declines will hurt your wealth, so how should you invest for the long term if you want to avoid stock market volatility? Real estate is famous for its positive cash flow investments. Simply charge more in rent than you pay in maintenance, financing, taxes and management costs and you’ll be in the black. But property investing is a tricky business. Finding good locations, choosing good tenants, and maintaining a residential or commercial real estate investment is no mean feat. If you prefer a hands-off solution, the best way to get started in real estate investing may very well be an online real estate crowdfunding platform. Investors who want to own residential property but don’t want the usual hassles should look to Roofstock. Beyond its online real estate marketplace listings, Roofstock rates each neighborhood and connects investors to property managers so the entire purchase can be done 100% online. Another way to generate cash flow from real estate is to invest in commercial properties. Up until a few years ago, you would have had to be a high net worth investor to be able to afford commercial real estate. But these days, you can piggyback on the trend of online crowdfunding to own a share of a commercial investment property. Rich Uncles is a company that specializes in commercial properties and student housing. The commercial investments feature high quality corporate tenants like Chevron and Dollar General, as well as triple-net lease terms and low leverage ratios. Conservative investors who want to earn a steady passive income stream from commercial properties will find it hard to beat the private REITs at Rich Uncles. Like Rich Uncles, Realty Mogul offers investors a way to earn passive income by investing in REITs. It’s an online marketplace connecting both individuals and institutions to residential and commercial property investments nationwide. Investors pool money to collectively buy real estate that may otherwise be out of reach. Thereafter, they own part of a company and a pro rata share of cash flow from owned properties. If the stock market or real estate investment doesn’t whet your appetite, peer-to-peer lending might be a better cash flow investing strategy. Online peer-to-peer marketplaces match borrowers in need of money with investors who provide financing in exchange for return. Investors step into the role usually filled by bank lenders because they loan out money at fixed interest rates and reap the rewards when loans are paid back. One of the most popular peer-to-peer online marketplaces is Prosper, which claims to have higher quality borrowers than average. Borrowers typically have above-average credit scores and above-average incomes. And each borrower falls into a “risk bucket” so investors can pick and choose which ones match their own appetite for risk. Select a borrower who is high risk and you will earn a higher interest rate but default risk may be higher. Prefer a steady passive income stream? Then a lower risk borrower is best but you will earn a lower interest rate too. If you are trying to figure out how to invest for cash flow, the obvious thing to do is look beyond your home. But it turns out one of the best assets that generate cash flow may very well be the home you own. AirBnb has grown bigger than most hotel chains by creating a marketplace of customers in search of homeowners willing to rent out rooms or whole investment properties. If you have a bedroom or two sitting vacant and want to earn cash flow from an existing asset, AirBnb is well worth checking out. Some homeowners claim to make tens of thousands of dollars a year in extra income from renting out rooms left vacant when kids left for college or from guest bedrooms that are hardly ever used. In the old days, you had to deposit money with a broker like tastyworks or thinkorswim before you could invest in stocks or ETFs. But that’s no longer the case because microsavings apps enable you to invest every time you swipe your credit card. Acorns is among the most popular and best microsavings apps. Each time you buy something at a grocery store, gas station, restaurant or elsewhere, Acorns rounds up your purchase to the nearest dollar and invests the loose change. The idea is those little “acorns” blossom one day to become a handsome nest-egg. And the nice thing is you don’t have to lift a finger. Once you’ve connected your credit card or debit card you’re good to go, Acorns moves the loose change to an investment account and manages your money. At the start, it may not add up to a whole lot but over time that nest-egg can produce a decent cash flow.